Departments of Dermatology and Venereology, Faculty of Medicine, Tanta University, Tanta, Egypt. Prolidase deficiency is a rare disorder inherited through an autosomal recessive gene. The hallmark of this disorder is the presence of characteristic face with saddle nose, mental retardation and chronic recurrent cutaneous ulcers that are recalcitrant in healing. The ulcers result from impaired recycling of proline which constitute 20% of amino acid in collagen and is important for tissue repair. Other features that are seen include frequent infections, partial deafness, visual disturbances and joint dislocation . 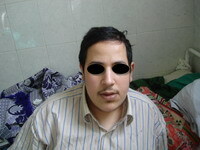 A 25 year- old Egyptian male presented to the outpatient Clinic of Dermatology and Venereology Department of Tanta University Hospitals in October, 2008. He complained of ulcer on the right leg since 3 years and another one on the dorsum of left foot since 2.5 years . The ulcers were slightly painful with history of delayed healing. There are oozing and crusted skin lesions on both palms and forearms with pruritus 7 months ago. He was suffering from difficulties in learning and unsocial behavior. He was hypertensive. No history of other systemic diseases or recent drug intake. Fig 1a: A 25 years male patient. He had an abnormal low hair line. 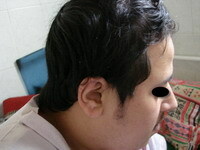 He appeared over weight, short stature with leaning forward deformity in his back. On local examination, deep well defined irregular ulcer 4x6 cm in diameter just above lateral malleolus of the right leg, It is characterized by irregular borders with prominent granulation tissue and purulent exudates and surrounded by dermatitic changes with crustation and hyperpigmentation. The other ulcer on the dorsum of the left foot was smaller and more superficial showing signs of healing (Fig 1b).. There are eczematous plaques on both palms and forearms (Fig 1c) and lymphedema in the right leg. No lymph node enlargement. Abdominal examination revealed nothing abnormal. 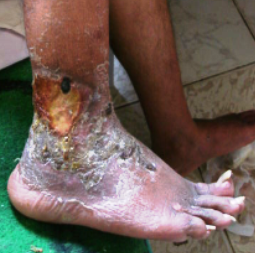 Fig 1b: Deep well defined irregular ulcer above lateral malleolus in the right leg and left foot, surrounded by dermatitic changes with crustation and hyperpigmentation. 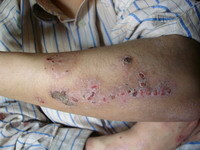 Fig 1c: Oozing and crusted eczematous plaques on both palms and forearms. Laboratory investigations revealed microcytic hypochromic anemia, thrombocytopenia, increase ESR and 24 urine collection showed increase in total hydroxyproline: 111.0 mg/day (N: 15.0 - 42.0 mg/day) and free hydroxyproline: 1.3mg/dl (N: < 0.4 mg/dl). Pelvi-abdominal ultrasonography revealed mild splenomegaly. A four mm punch biopsy specimen was obtained from the border of the ulcer including the adjacent intact elevated margin. Hematoxylin and eosin (H&E) stained sections revealed non- specific inflammatory infiltrate in the dermis with thin collagen fibers and perivascular amorphous material (Fig 2a) which stained +ve with Congo red stain (Fig 2b). Fig 2a: hin collagen fibers with perivascular amorphous material ( H&Ex100). 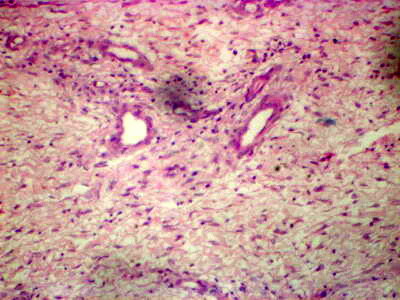 Fig 2b: Amorphous vascular deposits with congo red +ve (Congo red x120). The clinical, histopatholgical and laboratory findings were in keeping with the diagnosis of prolidase deficiency syndrome. The patient was treated with topical and systemic steroids, dapsone, high doses of vitamin C and packed RBCS transfusion every month for 2 months. He got satisfactory improvement with healing of the ulcers with scarring. a deficient recycling of proline and leads to impaired collagen synthesis and wound healing. [1,9,10,11]In patients with PD, amyloid deposits have been found within the vessels of the skin and internal organs, including the spleen. Splenic amyloid deposits lead to splenomegaly and subsequent splenic dysfunction. This may be the cause of the characteristic increased risk of infection in patients with PD . Although our patient had typical features of prolidase deficiency, the differential diagnosis included Wegener granulomatosis (WG), which has cutaneous involvement as the presenting sign in 9-14 percent of cases. 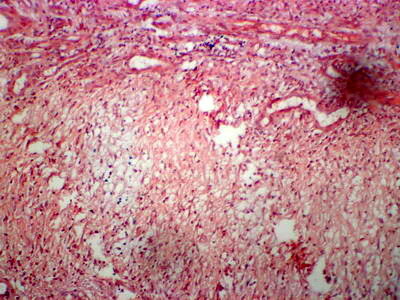 WG is a multisystem disease with a predilection for the lung, kidney, and eye . It can present with a limited cutaneous form in which there is no evidence of systemic involvement and negative ANCA testing . The presence of histopathologic findings showing palisading granulomatous inflammation with or without granulomatous vasculitis, and formation of neutrophilic microabscesses with a diffuse c-ANCA value is considered diagnostic of WG . In our case, ANCA testing was repeatedly negative, there was no subsequent development of systemic disease, and no systemic involvement was noted during a 12 month follow up; the possibility of WG was excluded by negative ANCA testing together with clinicopathologic findings suggestive of prolidase deficiency. We suggest that patients who develop chronic and recurrent leg ulcers, even those that resemble other inflammatory disorders, should be examined for prolidase deficiency. 1. 1. Berardesca E, Fideli D, Bellosta M, et al. Blood transfusions in the therapy of a case of prolidase deficiency. Br J Dermatol. 1992;126:193-195. 2. Der Kaloustian VM, Freij BJ, Kurban AK. Prolidase deficiency: an inborn error of metabolism with major dermatological manifestations. Dermatologica. 1982;164:293-304. 3. Endo F, Matsuda I. Molecular basis of prolidase (peptidase D) deficiency. Mol Biol Med. 1991;8:117-127. 4. Monafo V, Marseglia GL, Maghnie M, Dyne KM, Cetta G. Transient beneficial effect of GH replacement therapy and topical GH application on skin ulcers in a boy with prolidase deficiency. Pediatr Dermatol. 2000;17:227-230. 5. Jaeken J: Prolidase deficiency. Orphanet Encyclopedia January 2004. Available at:http://www.orpha.net; accessed September 20, 2004;. 6. Bissonnette R, Friedmann D, Giroux JM, et al. Prolidase deficiency: a multisystemic hereditary disorder. J Am Acad Dermatol. 1993;29:818-821. 7. Arata J, Hatakenaka K, Oono T. Effect of topical application of glycine and proline on recalcitrant leg ulcers of prolidase deficiency. Arch Dermatol. 1986;122:626-627. 8. Freij BJ, Der Kaloustian VM. Prolidase deficiency. A metabolic disorder presenting with dermatologic signs. Int J Dermatol. 1986;25:431-433. 9. Milligan A, Graham-Brown RA, Burns DA, Anderson I. Prolidase deficiency: a case report and literature review. Br J Dermatol. 1989;121:405-409. 10. Jemec GB, Moe AT. Topical treatment of skin ulcers in prolidase deficiency. Pediatr Dermatol. 1996;13:58-60. 11. Arata J, Umemura S, Yamamoto Y, Hagiyama M, Nohara N. Prolidase deficiency: its dermatological manifestations and some additional biochemical studies. Arch Dermatol. 1979;115:62-67. 12. Yasuda K, Ogata K, Kariya K, et al. Corticosteroid treatment of prolidase deficiency skin lesions by inhibiting iminodipeptide-primed neutrophil superoxide generation. Br J Dermatol. 1999;141:846-851. 13. Kokturk A, Kaya TI, Ikizoglu G, Koca A. Prolidase deficiency. Int J Dermatol. 2002;41:45-48. 14. Trent JT, Kirsner RS. Leg ulcers secondary to prolidase deficiency. Adv Skin Wound Care. 2004;17:468-472. 15. Leoni A, Cetta G, Tenni R, et al. Prolidase deficiency in two siblings with chronic leg ulcerations. Clinical, biochemical, and morphologic aspects. Arch Dermatol. 1987;123:493-499. 16. Ogata A, Tanaka S, Tomoda T, et al. Autosomal recessive prolidase deficiency. Three patients with recalcitrant ulcers. Arch Dermatol. 1981;117:689-697. 17. Arata J, Tada J, Yamada T, et al. Angiopathic pathogenesis of clinical manifestations in prolidase deficiency. Arch Dermatol. 1991;127:124-125. 18. Kavala M, Zindanci I, Sudogan S, Turkoglu Z, Sarigul S. Ulcus cruris associated with prolidase deficiency. Dermatol Online J. 2006;12:24. 19. Gibson LE, Specks U, Homburger H. Clinical utility of ANCA tests for the dermatologist. Int J Dermatol. 2003;42:859-869. 20. Kradin RL, Mark EJ. Case records of the Massachusetts General Hospital. Weekly clinicopathological exercises. Case 18-2002. A 48-year-old man with a cough and bloody sputum. N Engl J Med. 2002;346:1892-1899. 21. Larreque M, Charpentier C, Laidet B, et al. [Prolidase and manganese deficiency. Apropos of a case: diagnosis and treatment]. Ann Dermatol Venereol. 1982;109:667-678. 22. Lupi A, Casado B, Soli M, et al. Therapeutic apheresis exchange in two patients with prolidase deficiency. Br J Dermatol. 2002;147:1237-1240.